File marks on a vintage Plumb ax head, circa 1950. This old ax was found in new, unused condition. Before putting an edge on an ax, you should always check to see if re-profiling is necessary. Re-profiling means to change the shape of primarily the cheeks, that part of the head, just forward of the eye, down to within a half-inch of the bit., when viewing the head from above. In my poorly drawn example below, you can see that some axes can have a very thick profile while other are quite thin. Some may be very convexed and some may be ground nearly straight. The profile of the head makes all the difference in how an ax performs. The most common issue you will encounter is that the cheeks of the ax are too thick, even if the general shape is good. Sharpening an ax without first thinning down the cheeks makes for a dangerous, inefficient ax because the resulting edge will be stunted, making it likely for the ax to bounce out of the cut when chopping. 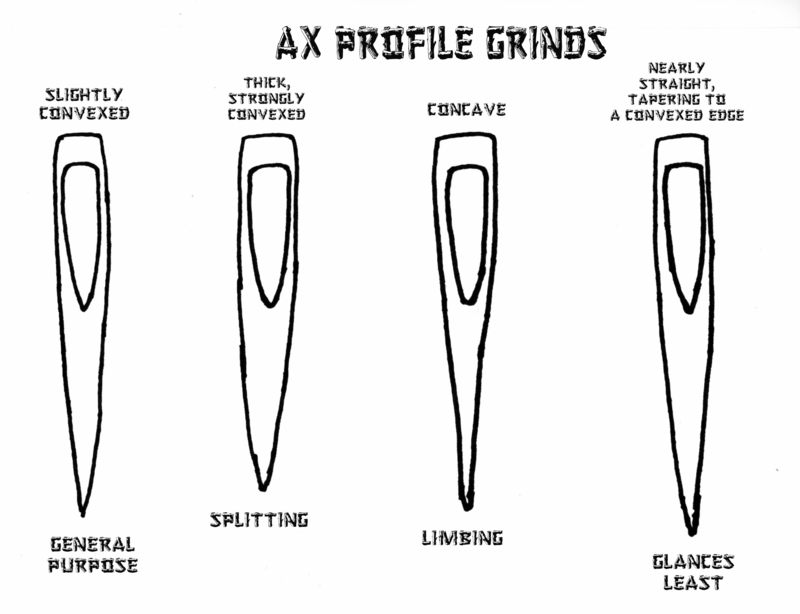 If any thinning needs to be done, you should endeavor to create a proper ax profile. This is one part of the re-profiling task. The other is to convex the bit into the edge. For now, we’ll look at getting the profile in order. Does your ax even need re-profiling? Today’s boutique axes are carefully ground for a specific use and usually do not need much in the way of re-profiling. True, their edges may be delivered less than sharp but the profiles are generally good. So, if you go the route of purchasing a boutique model, you will save yourself a lot of time and energy. 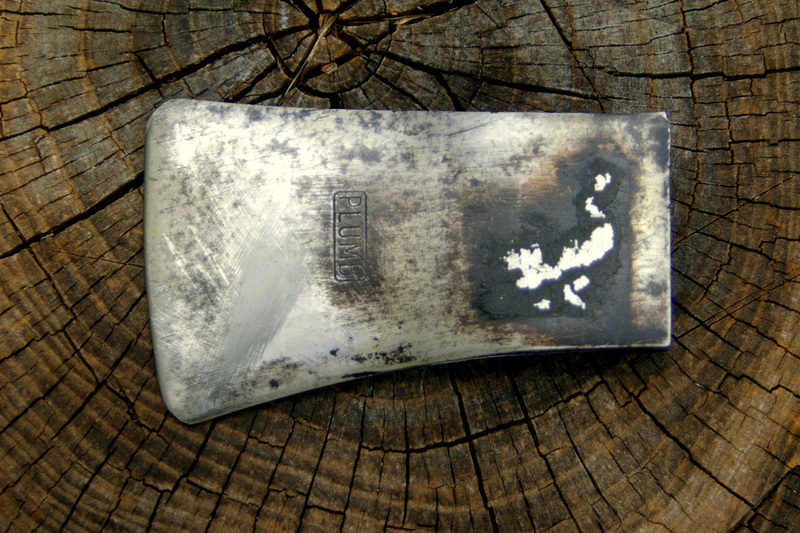 However, if you are dealing with a utility grade or vintage ax you may find that the profile will need some work. Vintages axes in particular were often left quite thick as it was assumed that the new owner would grind the ax according to its intended use. I’ve found a number of old axes that were never ground before the edge was sharpened. These are problems can only be corrected by re-profiling. What if the ax has been ground too thin? An ax that’s too thin doesn’t throw chips well and sticks with every chop, requiring a tug to free it. This is not only tiresome but will eventually result in loosening the handle. Such an ax may be used for limbing but it will never be a good splitting or chopping ax. Remember – you can always take steel off the head but you can’t add it back on! To determine if an ax needs to be re-profiled and how much work needs to be done, you’ll need an ax gauge. 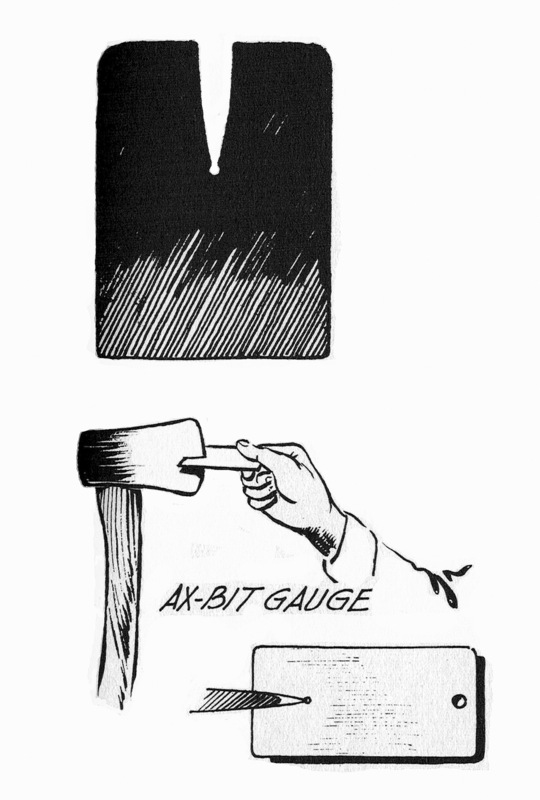 Bernard Mason included a full-size template for an ax gauge in his book Woodsmanship (A. S. Barnes and Company, New York, NY, 1954. 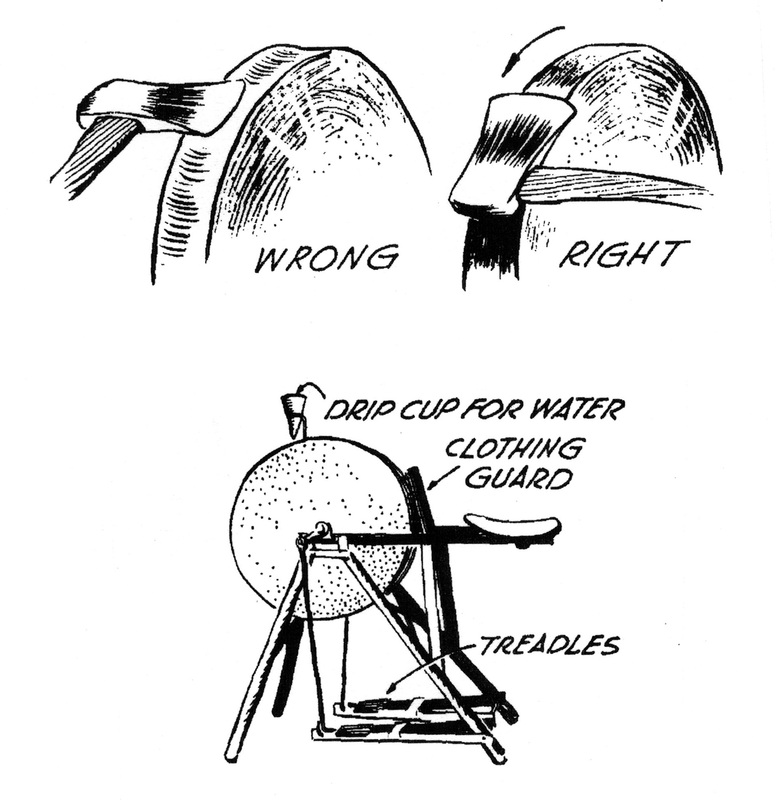 The illustration was also reproduced in the USFS Manual An Ax to Grind by Bernie Weisgerber (document No. 9923-2823P-MTDC, July 1999) on page 35. I’ve included the illustration here but note that it has not been reproduced in the size to be used as a template. Ax Gauge in use. While the cheeks of this ax have already been thinned down considerably, further work needs to be done according to the ax gauge. The bit should fit into the gauge, up to the point of the opening. I cut my gauge out of chipboard, a thick, sturdy cardboard found at any hobby or scrapbooking store. 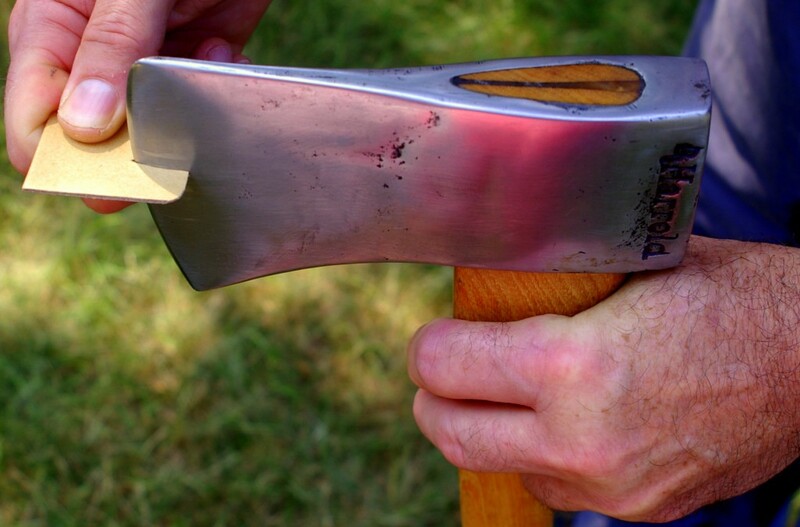 When checking an ax at this point, you simply want to determine if the bit will fit entirely into the gauge. If the cheeks are too thick and prevent the ax from fitting entirely into the gauge, re-profiling is needed. If the cheeks are so thin that the ax does not “fill out” the cutout of the gauge, it has been ground too thin. If the difference is slight, don’t worry, the ax will likely be a good one. If the difference is significant, well – you can always find another ax! 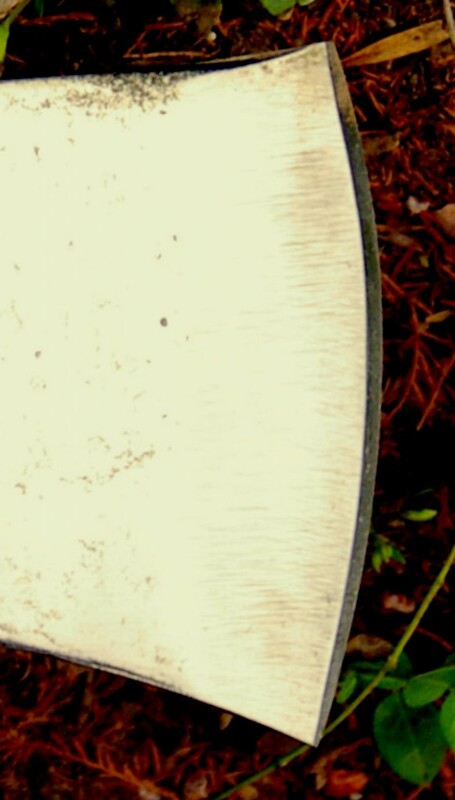 On a full-sized ax, the top of the fan grind begins at a point approximately 3-inches back from the cutting edge down to within a half-inch of the edge. This is to allow for properly convexing the grind into the edge. 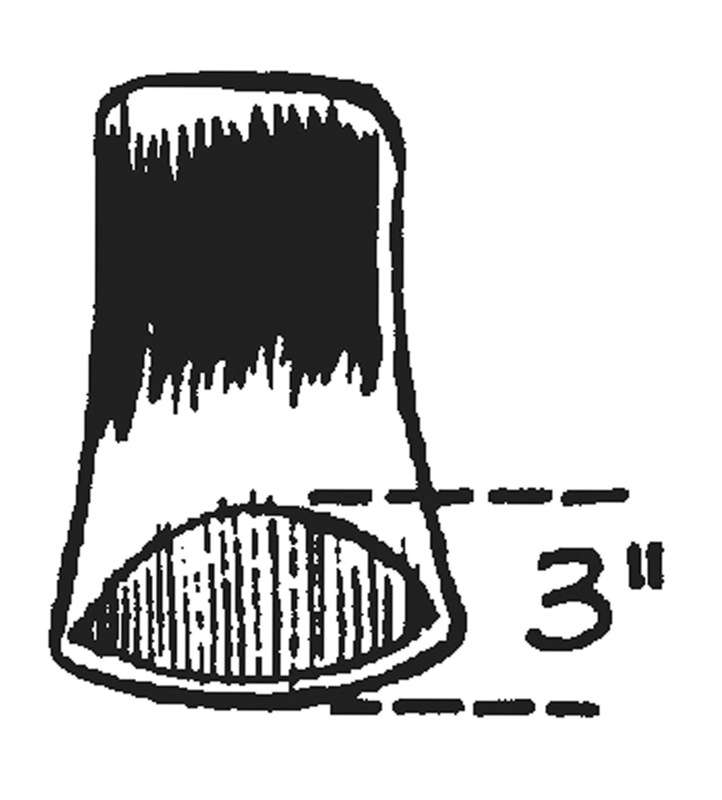 As the 3-inch depth is relative to a full-sized ax, it is of course, proportionally smaller if the head is smaller. There are a number of ways to re-profile an ax. The time-honored, traditional method is to use an old-fashioned pedal grindstone like the one pictured below. The modern, fast and efficient way to do the job is to use a belt sander. The Edge Master’s Pro Knife Sharpening System and the Work Sharp Knife and Tool Sharpener are two examples of belt sander sharpeners. The belt cassette of the Work Sharp device can be rotated into “grinder” position to be used hand-held, with the ax placed in a vice, making it very handy for this kind of work. When sharpening with a belt sander, be sure to keep the ax moving so that you do not risk ruining the temper. Just don’t let it rest in one spot for too long and always remember to use light pressure. While you generally do not want to apply enough pressure with a belt sander to create a shower of sparks, note that with the Work Sharp Knife and Tool Sharpener, sparks will always be generated when using the coarse and medium grit belts on carbon steel. No matter the brand of belt sander, when you are re-profiling, check the edge frequently with your bare hand to see if the edge feels warm. If it does, stop and let the blade cool down before making another pass. You do not want to generate enough heat to risk ruining the temper. It is best to have a can of cold water handy to dip the head into when it begins to feel warm to the touch. To lessen the chances of ruining the temper, it’s best to do most of the re-profiling with the single-cut mill file and only refine the profile with a belt sander. Re-profiling Tools: Top to bottom and left to right: 1) sanding block with mouse pad glued to the surface with Barge Cement. This one is used with sandpaper of various grits, 2) sanding block used with leather for stropping, 3) set of flexible diamond hones (coarse, medium and fine), 4) single-cut mill (ax) file (the filing grooves are only in one direction). The file is resting on a 5) file cleaning brush, 6) Gransfors Bruks diamond file, and 7) Gransfors Bruks standard ax file. The best tutorial over re-profiling using these tools and method can be found here. 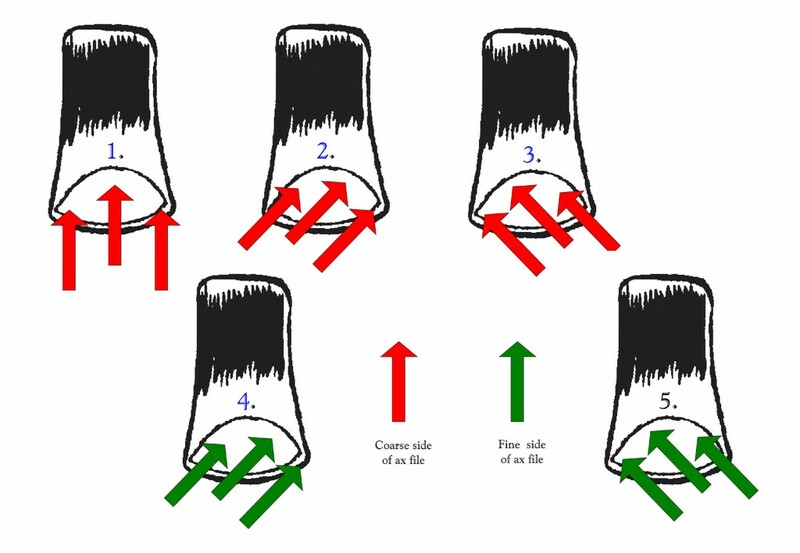 Though the video is about sharpening, the methods described can be modified just a bit for re-profiling. NOTE: I just cannot get an ax sharp enough for my liking by using this method. I think that perhaps I put too much pressure on the sanding block or something. As a result, I use a different method to hone the edge (I’ll get into that later). To begin, modify the tutorial by making straight strokes with the mill file, from the bit towards the poll, rather than at an angle. Keep the strokes flat at this point and DO NOT follow the curve of the convexed edge (if the ax has one). Tilt the handle of the file up and off of the bit while making the stroke, filing the flat of the blade using the coarse side of the file. Begin at at the center of the head, at the top of the convex “roll” (1/2 inch forward of the bit). Push the file toward the poll, ending your stroke at a point 2 1/2 inches back, to create the apex of the fan. You will immediately see the high spots that must be thinned down in just a few strokes. Do not file the flat of the blade farther back than the top of the fan or the ax will stick in the wood and will be weakened due to being too thin. The shiny, newly filed metal will serve as your guide, marking the boundary of the grind. Once the outer edge of the grind has been established at top center, move to the outside edges to work on the rest of the fan. I find it easier to switch at this point, from straight strokes to filing at an angle. Remember to tilt the tail of the file up and off the bit. File in opposing directions, starting with the coarse side of the file. Then follow with up with the fine side. Although the Gransfors Bruks ax files are much more expensive than a mill file, I prefer to use them for this purpose. The short length of these files limits waste removal to a distance of three inches, which is just right for the job. I find it easiest to clamp the ax to the edge of a work table to keep it steady using one bar clamp on the back of the ax head and two on the handle. After working on both sides of the head, check the bit in the ax gauge to see if more filing is required. Once the ax snugly fits the gauge, the filing is done. Once the fan grind has been created, clean up the rest of the head if it is significantly scarred, battered or pitted. Ignoring the bit (you’ll work on it later), use both sides of the mill file to smooth everything out, taking care to preserve the makers stamp. Your goal here is to reduce the appearance of pitting and other damage and square up the poll if need be. Do not attempt to file deep scars completely out as you could easily alter the shape or weight of the ax! When satisfied, go over the filed surface (including the fan grind) with 80-grit abrasive paper, followed by 100-grit paper and a 100-grit foam pad. The paper will quickly smooth out any offending rugosities while the foam conforms better to minor indentations. Now, return to the fan grind and use the sanding block as in the tutorial, working through the grits until you end up with a satin finish on every part of the head except the bit. NOTE: If the ax is not significantly scarred, battered or pitted, you can limit the filing and sanding to the area of the fan grind. Now you’re ready to start on the bit and edge. If the edge has suffered a chip or two, these need to be removed before you try to convex anything. Start by filing each chip out with the mill file. Just file the spot flat. When the edge is sharpened, any small flat spots will have been curved into the bit and will be unnoticeable. If the chips are larger, you do the same thing but beware! If you file away too much metal you can go beyond the hardened bit and end up with an ax that won’t hold an edge (I would pass up any vintage ax that is found with a deep chip). Once any chips have been filed out you are ready to convex the bit. All axes should have a convex profile. But what about the bit and how it is shaped? Some, like the Swedish boutique axes, terminate in a convex. Most others terminate in a “V “bevel. A convexed edge. This ax was never ground so the cheeks have not been thinned. You can see that the resulting edge is much too thick and needs some work. To create the right profile and edge, the goal is to blend the bit into the newly thinned cheeks in a smooth, uninterrupted convex profile and then work on whatever edge you desire as a last step. For this task, I use the plastic backed diamond hones. The thin plastic backing makes it possible to flex the hones slightly, which helps to develop a curved bit profile. Work through the hones from coarse to fine, following the instructions in the tutorial. You should end up with an unpolished convexed surface, from the cutting edge to the beginning of the fan grind. The convex is not done yet though! It requires further refining and to do that, I use a different method, requiring another set of tools. 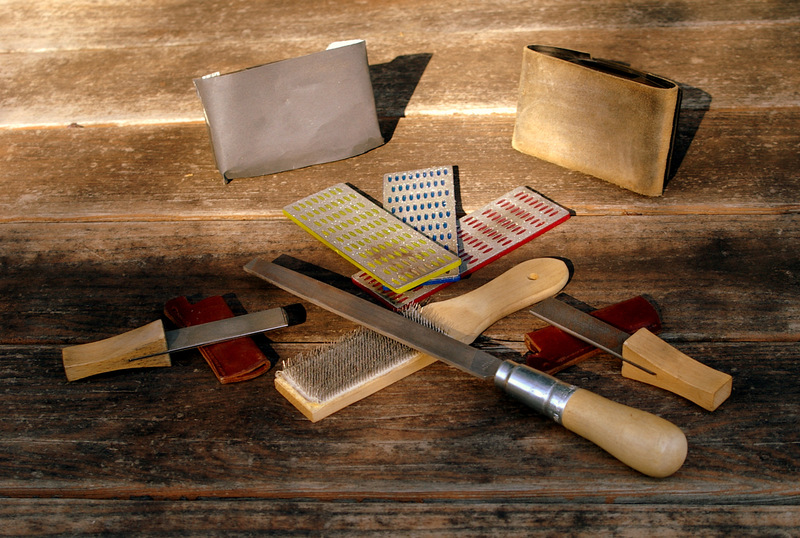 Bit Refining/Edge Honing Tools: Top to bottom and left to right: 1) Paddle hone, 2) Stropping compound, 3) mouse pad, 4) sandpaper and abrasive foam pads in various grits, 5) Ceramic hone (mine is from a Spyderco Triangle Sharpmaker), 6) Gransfors Bruks double-sided ax stone, 7) Eze-Lap diamond “stone”. 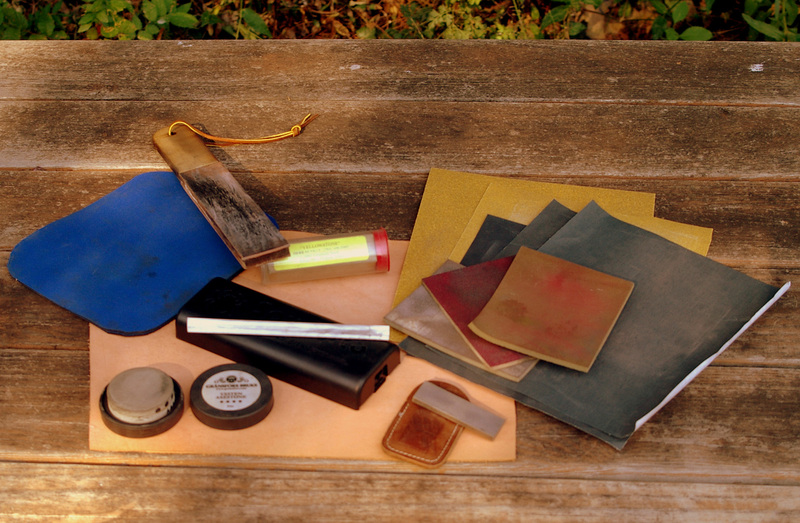 All tools are resting on 8) a large piece of leather, about 3/32 inch thick that I use in place of a mouse pad. Sandpaper. In grits varying from 80 grit through 600 grit paper (you can go further, with 600 grit or above bur remember, it’s an ax not a surgical scalpel). The sandpaper is laid upon either a mouse pad or if like me you use too much pressure, a leather pad. Eze-Lap diamond “stone”. The purpose of the stone is to create a small “V” grind at the edge. This results in less sharpness but makes the edge far more durable. Ceramic hone. Diamond sharpeners do not polish the surface of the edge and that is important to achieving maximum sharpness. The very hard ceramic serves to finish and polish the edge. (The Gransfors Bruks stone is used for field sharpening. In use, you start with the coarse side of the stone, followed by fine side). Leather paddle strop loaded with polishing compound. Even a highly polished edge must be stropped to remove the tiny burr that is the result of sharpening. A great tutorial over refining the bit can be found here (the ax tutorial begins two minutes, twelve seconds into the video). In order to establish a convex grind, I modify the tutorial by starting with 80 grit sandpaper to quickly develop the convex profile. The key to the system is using some sort of resilient backing for the sandpaper so that it conforms to the curvature of the edge and creates a convex profile. Usually, the backing is a thick foam computer mouse pad. Note that if you apply too much pressure to the tool being sharpened you can quickly dull the edge. This is because the resilient mouse pad allows the sandpaper to rise up over the edge which will quickly dull it. If like me you find that you use too much pressure, switch to a smooth square of leather about 1/8 to 3/32 inch thick. Leather is far less resilient than a mouse pad but will still do the trick. Once the ax fits into the gauge move on to finer and finer grits of abrasive paper to polish the surface of your work. I usually work up through 600 grit paper and then finish by stropping the edge (see below). The main reason that some like the terminal convex edge is because it’s sharper than one that is beveled. I generally prefer a convexed edge modified by terminating the convex with a small “V” bevel as it improves durability. Note that if you field sharpen an ax with a purely convexed edge, you’ll actually create some sort of bevel in the process. This video shows how field sharpening is done. Note that the instructor is using a properly thinned and convexed ax so is nothing more needs to be done. That’s the beauty of purchasing a fine boutique ax to begin with. The profile of the vintage Harrold ax I’ve been restoring is good according to the ax gauge. The edge has been given a small “”V” bevel for maximum edge retention. Finally, I polish the edge further by stropping it with a paddle strop loaded with polishing compound. When the edge of a cutting tool is sharpened, a burr is created along the very edge. This burr is like a very thin, flexible flap of steel, When you sharpen one side of the blade the burr flexes to curve over to the opposite side. When you sharpen the opposite side, it curves back to the side you are not working on and so on. The video above is about honing the edge using only sandpaper and it generally works well. However, this method produces a very long burr which I do not like. Holding the ax in one hand, edge away, I start by pushing the paddle across the curved surface of the convex, avoiding the very edge. The surface of the convex will quickly develop a high polish. As soon as the surface begins to really shine, begin to strop the edge. Stropping will remove the burr created by sharpening and will polish the edge smooth. Now, wipe the head down with light machine oil to remove the filing and sanding dust and you’re done! You should end up with a properly thinned and convexed ax that is quite sharp. NOTE: you often hear folks speak of an ax being razor sharp. I’ve done it as well. And of course, some axes such as the Gransfors Bruks models do come razor sharp. But shaving sharpness depends on the thinness of the bit and hardness of the steel. The Plumb ax pictured at top is just not hard enough to develop such a degree of sharpness. And while the Gransfors axes are indeed razor sharp, they accomplish that by being too thinly profiled to be a good all-around ax. 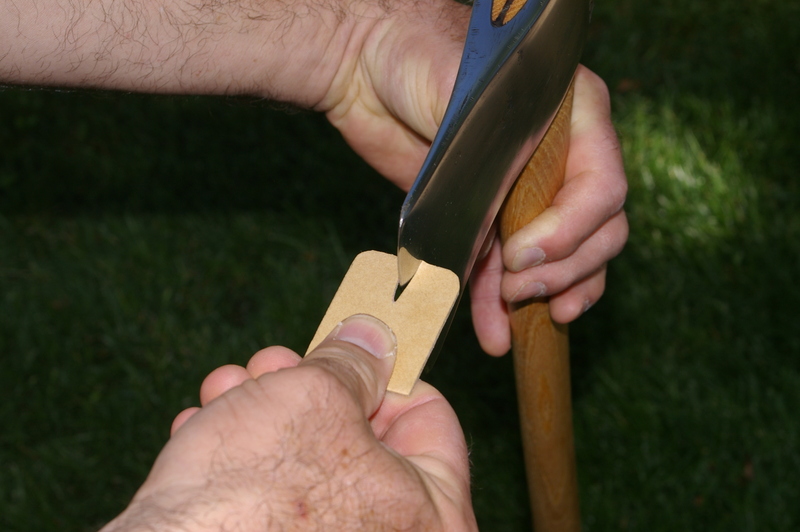 Also – axes do not have to be shaving sharp in order to do the work they are intended for. They are chopping tools. If you run your fingernail over the edge, it should bite into the nail and not slip off. That’s sharp enough for ax work. Once the re-profiling is done, only the edge of the ax will need to be touched up using the mouse pad/sandpaper method and the stone and strop. In just a few minutes your ax will be ready to use again. This entry was posted on Friday, September 6th, 2013 at 2:05 PM	and is filed under Edged Tools. You can follow any responses to this entry through the RSS 2.0 feed. You can leave a response, or trackback from your own site. I could not find ‘contact’ on your page so I decided to leave this note as a comment. Your blog is exceptionally well written and considered. You obviously have all the right experience and I hope you continue writing this for years to come. I especially liked your write up on the Velvicut Axes. Well done. Thanks for the kind words. As for my experience, I’m a self-taught novice just trying to find my way. I have considerable experience in backpacking and a bit in climbing. In fact, I spent part of a summer climbing in Yosemite (1983, where I hooked up with Bob Kamps and met Don Reid and Chris Falkenstein of YMC). I did a lot of climbs in Tuolumne Meadows that year. But with regard to traditional camping skills, I am learning all the time. Thank you! I love your website and can’t believe I’d never seen it until now.. You’ve done a great job with it. Yes, the ax work is worthwhile and enjoyable and you should try it soon. Many thanks for this clear blog entry. Much appreciated, from Down Under. As an aside, can I add that it’s possible for some stationary belt sanders to get grits up to #2000-3000. These come close to polishing and then a honing finishes the job. BTW axes are tempered at around 270 C. I doubt that if the steel gets hot to the touch there will be any further softening. 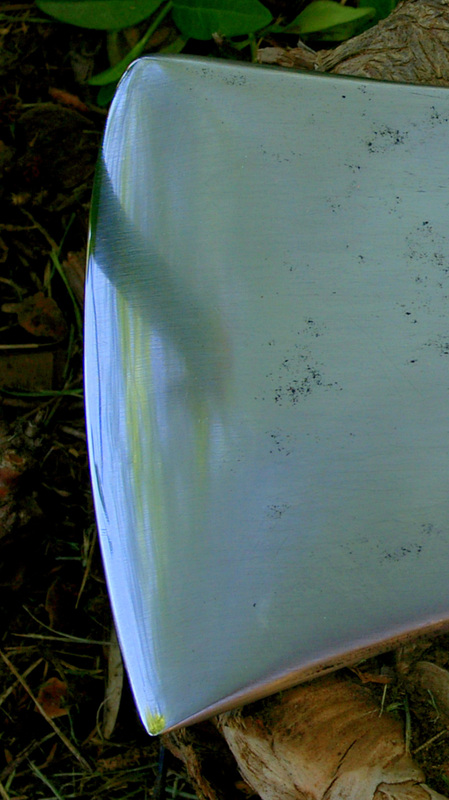 The key sign is if the surface is left blue/gray on carbon steel. Then you need to grind or file that out.